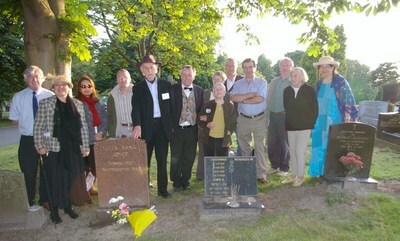 TO CELEBRATE Bloomsday (June 16) 2008, the Northampton-based Irish Community Arts Project organised a colourful commemorative event at the graveside of Anna Lucia Joyce, daughter of James and Nora Joyce, at Kingsthorpe Cemetery in the town. Event Organiser Peter Mulligan event opened the proceedingst by setting the scene of Bloomsday and the local connection with Anna Lucia, who was nursed in Northampton prior to her death in 1982. Other members of the Northampton Community Arts Project joined in with readings of A Flower Given to My Daughter by James Joyce and a new piece written in Joycean style by Peter Mulligan, (Entry to Granite), which is about the Martello tower from which 'Ulysses' emerges into the day. Gerry Molumby from Triskellion was invited down from Nottingham to participate in this year's event. Dressed as 'Joyce', Gerry read part of the 'breakfast scene' from Ulysses and the writer's classic and caustic poem Gas from a Burner. He also joined in the collective singing of some of Joyce's favourite songs of the period, including Love's Old Sweet Song, a number of which are referenced in his writings. James Joyce was himself a singer and this event was overall a fitting community led celebration of Bloomsday 2008 of which Joyce would have been proud. This document was last modified by David Granville on 2008-07-02 11:52:45.